The National Institute of Standards and Technology held a rescue robot exercise in Texas last week in which about three dozen robots were tested by developers and first responders in order to develop a standard suite of performance tests to help evaluate candidate mechanical rescuers. This exercise was sponsored by the Department of Homeland Security’s Science and Technology Directorate to develop performance standards for robots for use in urban search and rescue missions. Urban search and rescue robots assist first responders by performing such tasks as entering partially collapsed structures to search for living victims or to sniff out poisonous chemicals. NIST is developing robot standards for testing in cooperation with industry and government partners. The event took place at Disaster City, Texas, a test facility run by the Texas Engineering Extension Service (TEEX). The facility offers an airstrip, lakes, train wrecks and rubble piles that can be arranged for many types of challenging tests. Exercises included testing battery capacity by having robots perform figure eights on an undulating terrain and mobility tests in which robots ran through increasingly challenging exercises beginning with climbing steps and escalating to climbing ramps and then making it up steps with unequal gaps. 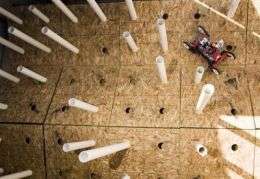 A new mapping challenge introduced at this event tests how accurate a robot-generated map can be—the robot must traverse a simulated “wooded area” that has uneven terrain and PVC pipes for trees, and create a map using its sensors. Researchers came from across the globe to collect data to feed into their mapping algorithms. NIST researchers developing ultra-high-resolution three-dimensional sensors also participated. Communications and manipulator tests were performed and discussed at the November exercise will be submitted to ASTM International as a potential rescue robot test standard. To see the robots in action, three videos can be viewed at the Disaster City TEEX Web site: www.teexblog.blogspot.com/ .